The markets have kicked off 2018 with a bang. Most major indexes are climbing at the fastest pace since 2003. The Dow Jones Industrial Average jumped 1,000 points in its fastest time ever, from 25,000 to 26,000. And investor optimism is at all-time highs as well. The surge to start the year sent a popular ratio, the put/call ratio, to its lowest level in almost four years. The ratio measures the amount of put options and call options investors hold. 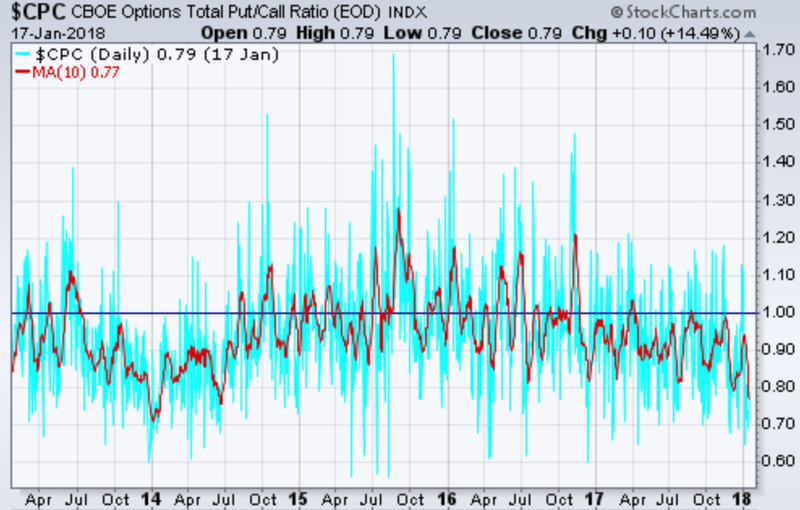 When there are more call options, or bullish bets, than put options, or bearish bets, the ratio is below 1. As the ratio gets farther away from 1, it starts to tell us what we can expect from the market — and right now, it’s telling us to expect a pullback. The blue line is the actual ratio. But what everyone watches is the smoother red line — the 10-day moving average of the ratio. This is a much easier way to read the put/call ratio, and it still tells us all the important information. You can see that the last time the moving average was this low was in 2014. Less than a month after that low, the S&P 500 dipped 4%. (To put that in perspective, last year the largest pullback in the S&P 500 was just 3%.) But in October of 2014, the S&P 500 experienced another 7% pullback. And if you look at the start of 2014, that was the lowest point on the chart for the red line. Just a couple of weeks later, the S&P 500 fell 5%. So, 2014 saw some serious turbulence in the market — but it wasn’t the end of the rally. That tells us we can expect a much bumpier ride in 2018, but in the end, the market is still climbing, and you will want to buy the dips. Editor’s Note: Natural resource insiders — major mining outfits and elite-level investors — have begun to pour more money into junior exploration companies than we’ve seen in the past five years. The last time there was this much capital flowing into new projects, it was nothing to see gains of 100%, 200%, 300% or more in a matter of months. And right now, at this very moment, more opportunities for gains as high as 1,000% are taking shape than we’ve seen in a long time. To find out why there are so many high-potential investments to take advantage of, click here to sign up for natural resource expert Matt Badiali’s special webinar presentation.